Achieving the perfect smile means having a full set of beautiful white teeth. After all, a smile full of empty spaces, discolored teeth, and uneven chompers can only spell tragedy for any family photo. Unfortunately, the years of eating sweet treats, occasionally forgetting to brush our teeth, and just living life can cause some serious wear and tear to our once-beautiful grin. In the case of largely missing teeth, how can you fill the grin you're in with beauty once again? At Johnstone Periodontics, you'll find that regaining that gorgeous smile of years past doesn't have to be a dream. Here, trusted dentist professionals make it a reality by using dental implants that are constructed to look completely natural, just like any neighboring teeth you still have. Dental implants are completely reliable and the implementation procedure is safe, too, as your dentist will administer anesthesia before placing a dental implant in place of your tooth root. It will take hold in your gums during the ensuing few weeks until it's nice and tight in its place, giving you the all-natural white smile you've been wanting for far too long! 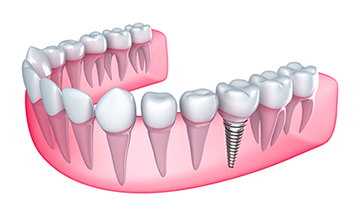 Made up of a small, screw-shaped titanium post, your dental implant shouldn't take long to be placed, and after the initial few weeks following the procedure has given your mouth ample time to heal, the implant will be topped with a dental crown already created to look just like your normal teeth. With a success rate of more than 95 percent, dental implants serve as the future of your bright smile, today! After all, no other tooth-replacement option comes with the same success rate as dental implants, so give the expert dental staff at Johnstone Periodontics a call today at (647) 348-4867 for a smile that will light up all of Toronto, ON!